Cities and citizens, not companies, ought to own the data produced in cities and should be able to use said data to improve public services and put their policies into action. Data cannot be controlled by a handful of tech giants. The structural shift to the digital economy and the fourth industrial revolution should trigger deep thinking. Artificial intelligence, massive computation, robotization and automation are quickly transforming our industry and society with disruptive application, from precision agriculture, to driverless cars, to the use of machine learning in healthcare. Digital platforms are powerful algorithmic institutions that are strongly transforming the labour market and challenging regulations. Automation of labour-intensive sectors such as manufacturing, logistics and transports have a big impact on the global commodity chain and on job dislocation and destruction. Indeed, the rise of digital capitalism brings many challenges— from monopoly power to the need for a new tax for digital platforms, trade regulations, unemployment due to automation, and questions around civil liberties. Large tech firms have a combined market value of $3 trillions, and have offshored around $1 trillion in the last decade, while they are issuing debt on the US public market at very low interest rate and use it for shares buybacks. This means that 80% of corporate wealth is in the hands of 10% of firms, leading to an increase in corporate profit and wealth inequality. Furthermore, the public sector is increasingly dependent on the tech industry. Yet, we rarely ask where this power and dependence comes from. Why does the immense economic value that such digital revolution accrues go exclusively to technology firms – and not to ordinary citizens or public institutions? And what can we do to ensure that we return some of that value back to citizens, while empowering them to use technology to participate in politics as well as to offer better and more affordable public services? It is obvious that we need to re-politicize the question of technology and that the discussion should be about the redistribution of assets and power, and the management of future welfare services and critical infrastructures. Given the gloomy state of politics on both sides of the Atlantic, this might seem mission impossible. And yet, there is one bright spot on the horizon: cities can become laboratories for democracy and sustainability. They can run smart, data-intensive, algorithmic public transportation, housing, health, and education – all based on a logic of solidarity, social cooperation, and collective rights. When we talk about urban technology and data, we are dealing with some kind of meta-utility – composed of those very sensors and algorithms – which power the rest of the city. As cities lose control over said meta-utility, they find it increasingly difficult to push for non-neoliberal models in supposedly ‘non-technological’ domains such as energy or health care. One highly useful concept for cities seeking to preserve a degree of autonomy in this digital world is that of ‘technological sovereignty’ – a rather simple idea which denotes citizens’ capacity to participate in how the technological infrastructure around them operates and what ends it serves. The notion of ‘sovereignty’ – whether of finances or energy – permeates the activities of many urban social movements. Concepts like energy sovereignty may be easily grasped and capable of mobilizing large sections of the population, but what does energy sovereignty mean once we transition onto the smart grid, and firms like Google offer to cut our energy bills by one third if only we surrender our energy data? Does the struggle for ‘energy sovereignty’ mean anything if not intricately tied to the struggle for ‘technological sovereignty’? Probably not. The public sector is increasingly dependent on the tech industry. Yet, we rarely ask where this power and dependence comes from. Why does the immense economic value that such digital revolution accrues go exclusively to technology firms – and not to ordinary citizens or public institutions? A fight for digital sovereignty should be coupled with a coherent and ambitious political and economic agenda capable of reversing the damage brought by the neoliberal turn in both urban and national policy. Well-targeted pragmatic interventions can have a big impact. Insofar as signing smart city contracts requires purchasing software licenses, every effort should be made to demand free software and open source alternatives. Barcelona is a pioneer on this front, having defined a Digital City Strategy pledging to drop Microsoft products from its system and investing over 80% of its new IT development budget in free software and open source services, while also introducing ‘data sovereignty’ clauses in public procurement contracts and defining the ethical digital standards to be followed by public officials in the digitalization process. 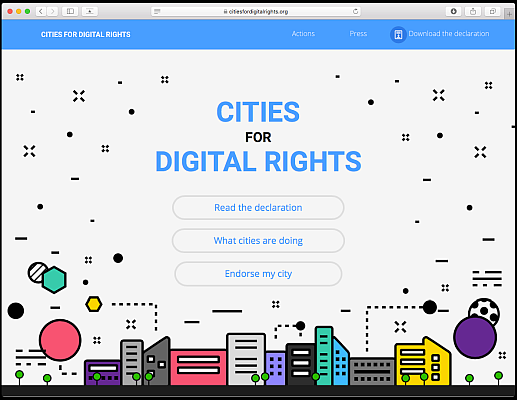 The right to the city might need reformulation as the right to enjoy rights altogether, as the alternative brings with it the risk that digital giants will continue redefining these rights. What, for example, does a right to the city mean in a city operated by technology companies and governed by private law, with citizens and social communities unable to freely and unconditionally access key resources like data, connectivity, computing power, which could allow them to pursue self-management? And to what extent would losing control over the information-powered meta-utility undercut successful remunicipalization campaigns, whether to reclaim energy, transport or water infrastructure, allowing the utilities in question transition to their own ‘smart’ consumption model with a new set of private intermediaries? Ultimately, brave cities that want to deploy key resources and digital infrastructures under a different legal and economic model that produces outcomes which would benefit local residents and local industry must show that the economic models proposed by the likes of Uber, Google, and Airbnb do not deliver the promised results – at least not without causing a considerable amount of damage to the cities in question, from the rise of the speculative economy and gentrification, the precarization of labour and the immense blockage of social innovation for those without access to data. Many of these alternative experiments to achieve digital sovereign cities must happen with the participation of other like-minded cities and with stronger synergies at national, European and global level, as demonstrated by promising projects such as the Cities Alliance for Digital Rights initiated by Barcelona, NYC and Amsterdam. Changing the data ownership regime may be a viable option, if only because it would not require massive financial commitments and represents an agenda with intuitive popular appeal: cities and citizens, not companies, ought to own the data produced in cities and should be able to use said data to improve public services and put their policies into action. In the fourth industrial revolution, data and artificial intelligence (AI) are essential digital infrastructures that are critical for political and economic activity. Data have become the most valuable commodity in the world. They are the raw material of the digital economy, and fuel AI. Companies in every industry are counting on artificial intelligence to drive growth over the next years, and machine learning will increase their return on investment by anywhere from 10 to 30%. Data cannot be controlled by a handful of tech giants. Business models that exploit personal data to pay for critical infrastructures are broken. We need to democratize data ownership and artificial intelligence, and move from data extractivism to data commons. Taking a firm stance on data ownership may accomplish several goals at once. 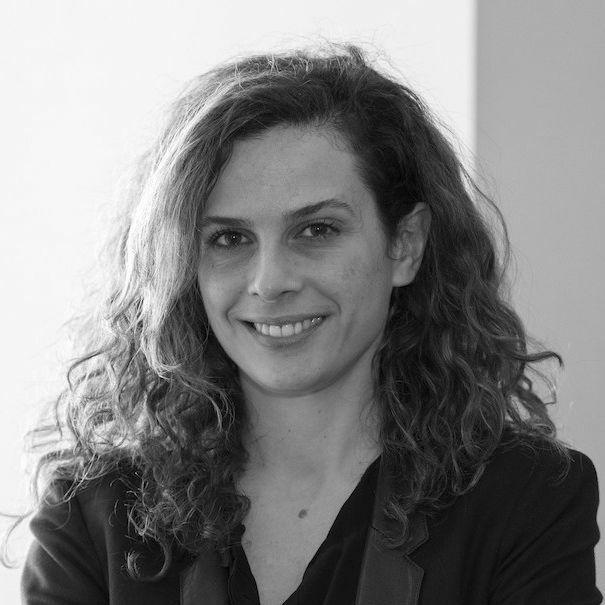 Firstly, it would make the rampant real estate speculation facilitated by the likes of Airbnb much more difficult: cities and ordinary citizens would be able to check whether the claims frequently made by Airbnb in its defence – that it primarily benefits ordinary users – are empirically verifiable. Secondly, placing cities in charge of their own data would remove one of the main bargaining chips firms like Uber now have when negotiating with regulators: in Boston, for example, Uber offered the authorities access to traffic data expecting lighter regulation in return. Thirdly, it seems highly unlikely that cities could stimulate growth of a robust, decentralized local alternative without a solid alternative data regime: if this is lacking, these smaller contenders may prove unable to compete with these giants. The immense economic value that such data represents should be returned to citizens. By helping citizens regain control of their data we can generate public value, rather than private profits. To take one of the most ambitious examples, Barcelona is taking a new approach to data called ‘city data commons’, meaning to strike a New Social Pact on Data to make the most out of data, while guaranteeing data sovereignty and privacy. Data are a city’s key infrastructure, and can be used to reach better, faster, and more democratic decisions, incubate innovation, improve public services, and empower people. Business models that exploit personal data to pay for critical infrastructures are broken. We need to democratize data ownership and artificial intelligence, and move from data extractivism to ‘data commons’. Barcelona is experimenting with socializing data in order to promote new cooperative platforms and democratize innovation. This is the objective of DECODE, a project Barcelona leads with 13 partner organizations from across Europe, including Amsterdam. The DECODE project develops decentralized technologies (such as blockchains and attribute-based cryptography) to give people better control of their data, in part by setting rules on who can access it, for what purposes, and on what terms. Our goal is to create ‘data commons’ from data produced by people, sensors, and devices. 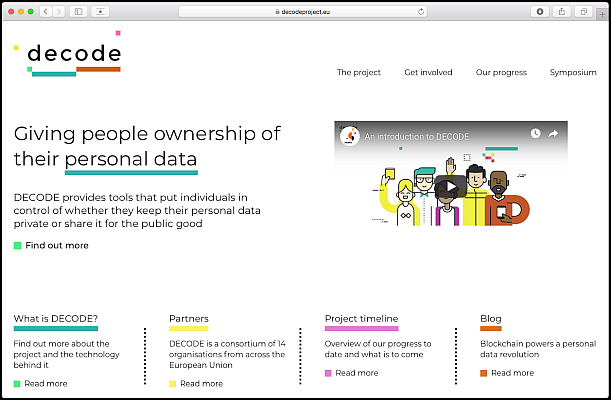 A data commons is a shared resource that enables citizens to contribute, access and use the data – e.g. about air quality, mobility, health – as a common good, without intellectual property rights restrictions. Barcelona envisions data as public infrastructure alongside roads, electricity, water and clean air. It is a meta-utility that will enable us to build future smart public services in transportation, healthcare, education. However, we are not building a new Panopticon. Citizens will set the anonymity level, so that they can not be identified without explicit consent. And they will keep control over data once they share it for the common good. This common data infrastructure will remain open to local companies, coops, social organizations that can build data-driven services and create long-term public value. Involving citizens in Amsterdam and Barcelona, DECODE addresses real-world problems, e.g. it is integrated with the participation platform decidim.barcelona already used by thousands of citizens to shape the city’s policy agenda, with over 70% of the Government actions proposed directly by citizens. Rather than using the personal information of voters (furnished by the likes of Cambridge Analytica) for manipulation, we plan to use data-intensive platforms to boost participation and make politicians more accountable. Data commons can also help cities develop alternatives to predatory on-demand platforms like Uber and Airbnb. Introducing fair regulation and algorithmic transparency to tame the on-demand economy is necessary but insufficient. Barcelona has launched a variety of initiatives to empower sharing economy alternatives such as platform cooperatives and experiments with next-generation collective platforms that work for the public interest. We can start from cities to challenge the current narrative dominated by Silicon Valley’s leaky surveillance capitalism and dystopian models such as China’s social credit system. A New Deal on Data, based on a rights-based, people-centric framework, which does not exploit personal data to pay for critical infrastructure, is long overdue. Europe just passed new data protection rules based on worthy principles such as ‘privacy by design’ and ‘data portability’ and ‘the right to be forgotten’. Coupled with new regulatory instruments in the areas of taxation, antitrust, and digital trade, such bold interventions can create alternatives where citizens have greater power over their data and the future built with it. As we ask how we could create a financial sector that serves the real economy, we should be asking how could we create a digital sector that serves the people? We need a New Social Pact for the digital society that will make the most of new technologies, access to data, and artificial intelligence, while guaranteeing citizens’ fundamental rights, workers rights, environmental standards and gender equality. This new social pact will require rethinking the economic model for the digital society making sure it can create public value and not only private profits, reconquering critical digital infrastructures – long surrendered to the likes of Facebook, Alphabet, and Microsoft – and protecting citizens’ digital sovereignty. 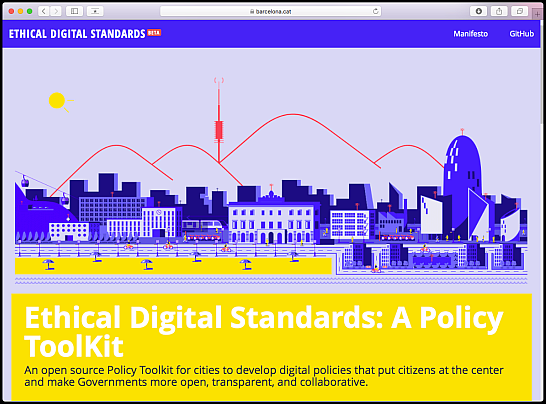 It is a matter of democracy, and cities like Barcelona can show the way and open a path for a network of digital sovereign cities reclaiming democratic governance of 21st-century infrastructures, including data sovereignty and ethical AI for citizens. In this way we will shape a digital future for the many, not the few.